Episode 31: This Is Suicide! 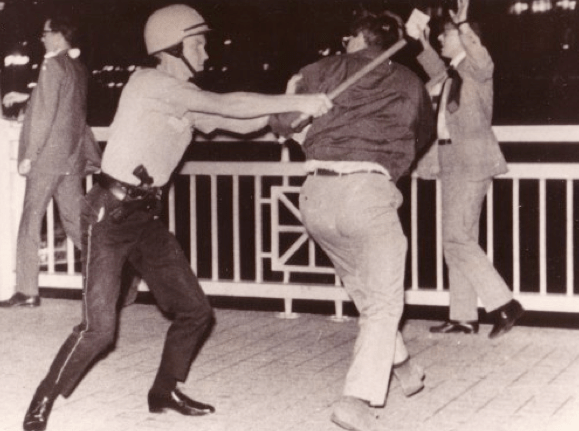 Sunday night, August 25th, 1968. 10:45 pm. Anna takes stock of her life. She has been sitting upright in this living room sofa for the last three months of her life, never once rising from it to, say, get a glass of water or even to relieve her never-ending bulging bladder. She has also gained so much weight that her bathroom scale cannot possible accommodate her. She has to weigh, oh, probably 900 pounds at this point. Maybe more. Yes, it really feels that way. Anna’s inner soliloquy: Jesus Christ, Dr. Francona better be right about the due date. Three more nights. That’s all. I wish there were a drug that would make me unconscious until then. I wish. I wish…. Anna would swallow that pill without a second thought. This pregnancy business is a mother. She drifts off into fitful sleep, lulled by the mantra, I wish, I wish, I wish…. Speaking of mantras, Anna’s husband [and the man responsible for her blimpish state], Anthony, is hearing one as well, only it isn’t lulling him to sleep. It goes Om — a simple monosyllabic, two-letter plaint to the Universe, drawn out, O-o-o-o-o-o-o-o-o-o-o-o-o-o-o-o-o-mmmmmmmmm, as long as its utterer can bear. It evokes the shapeless, dark energy from the hidden corners of existence, a Vedic monotone inviting a god, any god, to partake of the sacrifice to come, and by his good graces, prevent skulls from being cracked open. 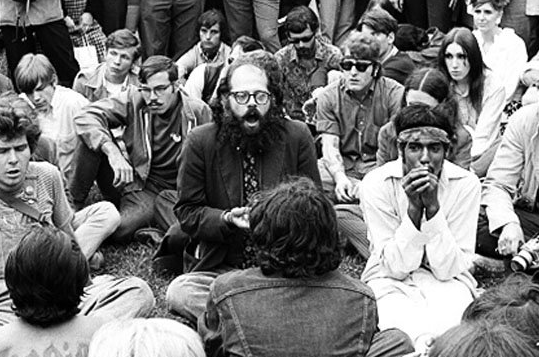 Some dozen or so utterers of Om have created their apian buzz in the middle of this sea of anxiety, led by the chief utterrer, the poet Allen Ginsberg. He sits in the lotus position in the Lincoln Park grass, in the dark, his little group as well as a much larger group of lefties, freaks, clergy, medics, and hangers on surrounded by a force of hundreds of riot-equipped Chicago police officers backed up by hundreds of Illinois National Guardsmen standing at present arms with fixed bayonets. This Om is all some people think they need to protect themselves against the rifles, pistols, blades, blackjacks, and clubs of the assembled sky-blue- and khaki-green-clad peacekeepers. The poor dopes. Adding aural texture to the Om overture — the Om-erture, as it were — is the constant banging of drums, a pounding that has not stopped since earlier, in the afternoon, after the first cop attack that left only a few dozen freaks with centimeters-long rips in their scalps and splitting headaches. That, in the vernacular of this baseball town, was only batting practice. People who have them begin to check their watches. Some call out the minutes before the pigs’ witching hour. Freaks have climbed trees, the better to see over the little ridge at the north end of this section of the park, the staging area for the police and National Guard skirmish lines. Skirmish lines that everybody here is convinced — that is, all except for the Om-ers — will sooner than later became attack lines. The drums go on but, eerily, the guitar strumming, equally ceaseless up until only 20 or so minutes ago, has stopped. It’s a hell of a lot easier to run with a drum than it is with a guitar. And people are ready to run. Only they have no idea which way they’ll go. A sandy-haired freak, tall and thin as Abe Lincoln, a reed, or a shaft of wheat, has been dancing circles around the anxious other freaks and serious lefties waiting for the clock and, surely, the club, to strike. He has been taunting the crowd, calling them cowards for leaving the park at 11 pm the previous two nights, in obeisance of police orders. He laughs at them as he gibes. He teams up with another freak, this one husky, upon whose shoulders a short kid climbs so he can wave a Viet Cong flag stapled to a rickety standard. The flag’s gold star is certain to arouse the cops, many of whom have brothers or cousins in Nam, but is meaningless to the Guardsmen, most of whom enlisted just so they could avoid that Southeast Asian hell. It’s the cops, though, whose skirmish line will sweep down before the Guards’. The husky kid doesn’t know it — or does he? — that his VC flag is as a red cape whipped before the eyes of hundreds of snorting bulls. One of the marshals tries to pull the kid off the husky freak’s shoulders. Another tries to tear the VC flag out of his hands. The kid, though, has locked himself into place with what seem the iron thighs of a gymnast and, with the iron grip of a young athlete who has developed extraordinary forearm and hand musculature thanks to hundreds of hours spent on the high bar, keeps his flag. Anthony thinks, I’ve seen that kid somewhere before. Now, the tall, thin freak and the husky freak/VC flag kid duo, who have become default leaders of this chaos suddenly and for no good reason, begin to lead an impromptu, ragtag parade southbound out of the park toward the triangle of land formed by the split of LaSalle and Clark street. This, just as the cops’ skirmish line begins to advance in the dark with a Hollywood horror movie glow of floodlights backlighting them. 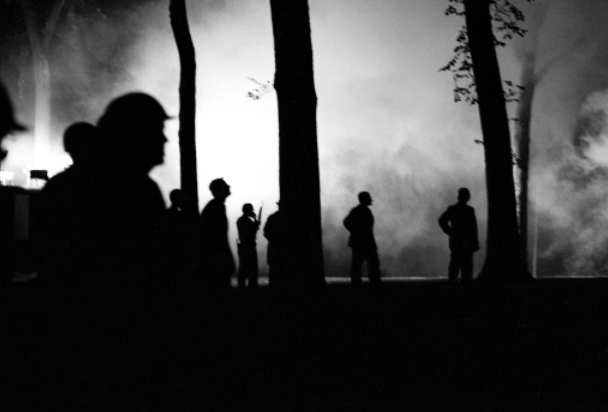 The cops, who crave the coming clash as much as the freaks et al fear it, almost visibly recoil, a comic double take, and begin to dash southward themselves, sprinting as much as middle-aged men can run, to head the march off. The marchers tramp south on LaSalle and most turn west on North Avenue, creating a monstrous traffic jam. They pound their palms on idling cars’ hoods and trunks, inviting motorists to honk their horns for peace, for the young, for revolution, and for the hell of it. A smaller group continues south on LaSalle, aiming to surround the Conrad Hilton south of the Loop but, Anthony will learn later since he remains with the larger group, are trapped on the Michigan Avenue bridge where another brigade of cops pound their heads in. The cops here somehow get ahead of the marchers on North Avenue, reconstituting themselves into an attack line and steer the freaks north on Wells, past the Earl of Old Town, the Second City, Piper’s Alley, and all the other Chicago tourist meccas of the New Generation, the Now Generation. Everyone’s pace now quickens. They wind up again at the trinagle of land formed by the split of LaSalle and Clark. And — wouldn’t you know it? — with the VC flag kid shouting “Revolution!” continually behind him, the tall, thin freak urges the marches to go back into the park. The march, having no known destination from its onset, has come full circle. He has, Anthony concludes, absolutely no idea who Che Guevara is. But the lightbulb flashes on over Anthony’s head: “Yeah,” he whispers under his breath, “I know that kid!” He is Jimmie Finnin, the Jungle Man. Anthony thinks: He’s no freak. He’s a greaser! And a second lightbulb goes on above Anthony’s head: Jimmie Finnin, the Jungle Man, is a plant. Now the two sides face off against each other in the exact spot where they would have faced off had the freaks not taken their circular stroll. The two sides stand facing each other in the slight hollow between the rises of Stockton Drive and Clark Street. Freaks and cops gaze into each others’ eyes from a distance of, at best, five yards. Who, both sides wonder, will blink? And so what? The cops themselves have adopted the pejorative as their own nickname for each other. They’re proud to be pigs! Magic words, these. 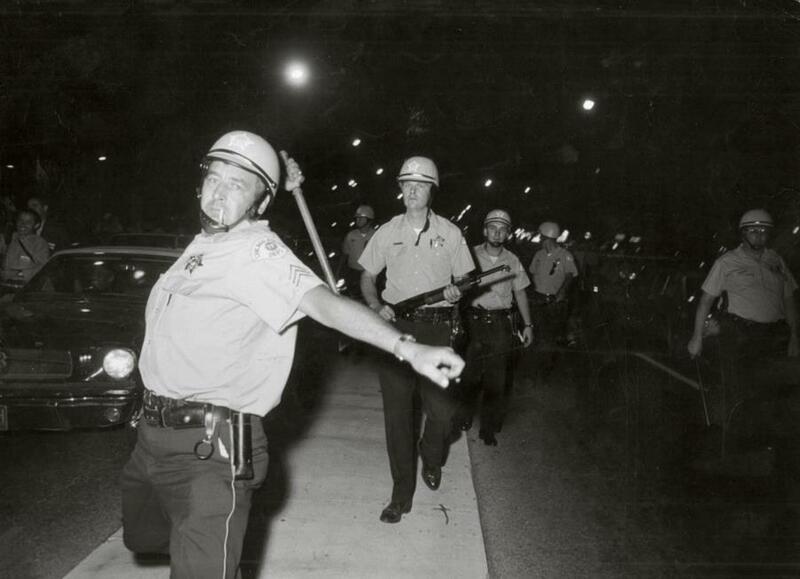 The police skirmish line moves forward, the cops’ nightsticks held two-handed like the handles of push mowers to shove the freak mass up the rise leading to Stockton Drive. Panic. The cops are pushing the freaks into the darkest part of the park, not out of it. This is not to be a dispersal; it will be a massacre. And, like that, the battle begins. Freaks, and medics, and squarish lefties, and Jean Genet, and Allen Ginsberg, and William S. Burroughs, and Terry Southern, and Norman Mailer, and Tom Hayden, and clergymen, and nuns, and — Wait, Anthony thinks, where’s that Finnin kid? He’s gone! Gone! — all of them scatter and run. The cops, their eyes gleaming, their teeth bared, their badges and nameplates nowhere to be seen, give chase. The battle will last for a good six hours, petering out only with the first light of dawn over the lake in the east. The theater of battle will range from Armitage Avenue to Division Street, a city mile south. A favorite spot for summary corporal punishment, for justice at the business end of a billy club, turns out to be the confined space between two parked cars. Not only is the receiver of the clubbing prevented from any means of escape, but passersby and those photographers fortunate enough to still have their cameras will be unable to actually see the repeated impacts of hard oak on ribs and skulls. Near dawn, Anthony makes his way to The Theater on Wells Street. It serves as the emergency hospital for the wounded. Medics have wrapped dozens, no, hundreds of bloody heads with gauze bandages. The flat roof of the The Theater building serves as a crash pad for dozens of freaks. Anthony can’t sleep, though. He volunteers to help guard the front doors of the place. Each time someone bangs on that front door, likely as not bleeding profusely from a scalp wound or hunched over with a broken rib, the guards crack the door open a few millimeters, just enough to make a snap judgement that the banger is not a plain clothes cop. At one point, the guards begin to allow in none other than the kid who had been carrying the Viet Cong flag. Or, as Anthony now knows, Jimmie the Jungle Man Finnin. Anthony leaps forward and slams his weight against the door, coming thisclose to severing the Jungle Man’s strong fingers.